Lying in bed at night with open windows, ears tuned in to every creak, each movement. Hyper-aware, restless, anticipating and dreading the sound to end it all - the shot. 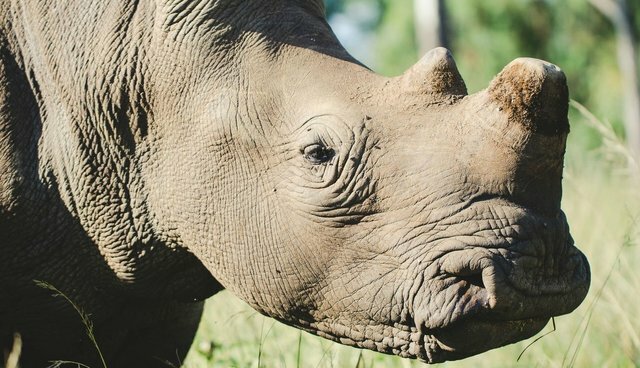 As rhinos are moved into the "Intensive Protection" zones in South Africa's Kruger National Park, poachers haven't stopped targeting rhinos, they've simply started looking for easier targets. 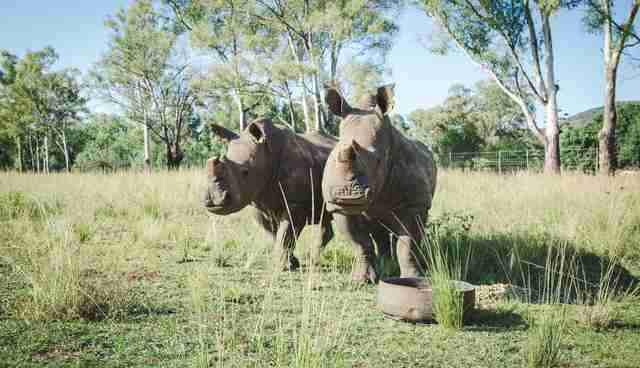 Outside of the bounds of Kruger National Park, there are smaller farms privately raising and caring for rhinos. These people have little to no support. The cost of raising rhino is already high just for basic vet care and feeding. But this feat becomes almost impossible when you factor in the necessity of security. Growing up near Limpopo, South Africa, she lived on a family farm, taught love and respect for nature and the wild animals she was exposed to. Years down the line she met her husband who is a farmer in the area and they started a small breeding program with antelope. But it was always her dream to have rhinos. A neighboring farmer, afraid of the poaching scare and not able to afford the continuous security expenses, put his rhino up for sale. Thinking it was meant to be, she jumped at the chance. Now Moomin and Moemy (as they're affectionately called) are part of the family. "When we set up the rhino camp we chose a location very close to our house. During the day we've organized with everyone who works on the farm to drive around the rhino camp at certain times of day. They then report back to me on the exact location of the rhinos, and if they can't see them I immediately go out to go find them. It's effectively a makeshift patrol system that we've created; everyone on the farm is aware of the risk and we have a code-word which we use to alert everyone if any suspicious activity is spotted anywhere on the farm. 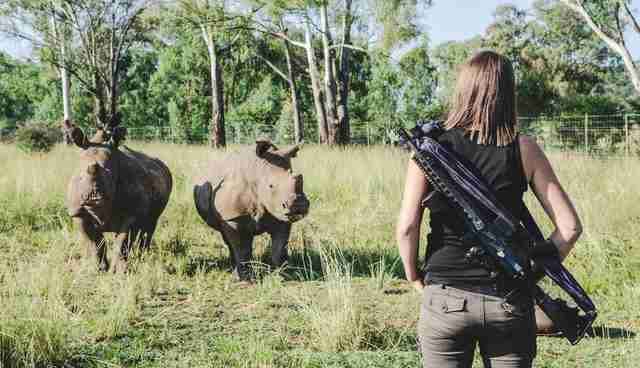 They each have a specific location they will then go to help minimize the risk and protect the rhinos. Security is also always on speed dial, day and night." "At night the whole farm is on high alert, we also sleep with our windows open so we can immediately hear if any shots are fired. My husband now sleeps with a gun loaded and ready next to bed. We do a final drive around the camp just before we go so sleep and then we ready ourselves as to be able to react as quickly as possible in case anything was to happen. This all is of course in the hope that we can get to the poachers before the poachers get to our rhinos." But soon after taking in their beloved rhinos, reality hit close to home. A neighboring farm had their rhino bull poached. "Ever since that night we've become very aware of helicopters flying over the farm. Now of course there is no way to know if they are looking for rhinos or not, but the frequency has definitely increased and I've been told by other farmers that this is a method they use to look for potential targets. As soon as we hear them we try to get our two under cover, but as you can imagine that's not always possible." And how has all of this effected the family? "During the day, and especially the late afternoon we don't allow the children to play beyond the garden parameter anymore. We know at certain times the farm is more vulnerable and I would never be able to forgive myself if anything was to happen to one of my children." "I've started to notice how all of the activity and risk around the rhinos have affected my boys. Especially the elder one who understands more of the reality of what's going on. His teacher called me in a few weeks ago as she was concerned about some pictures he had drawn. They were drawings of poachers trying to get under the fence to kill the rhinos. It broke my heart. We've spoken very openly to all of them about the implications of what we're doing, and we've also explained our reasons behind it. I just pray that in the long run that this whole thing will make them stronger as individuals rather than scar them for life." Currently her children spend their days in the bush with Yana and have all said they want to be game rangers. The idea there may not be anything left for them to protect is the biggest driving force propelling her forward to keep rhinos safe.